In Case You Missed It: Check Out Hope Hall’s Woodworking Program in the News! 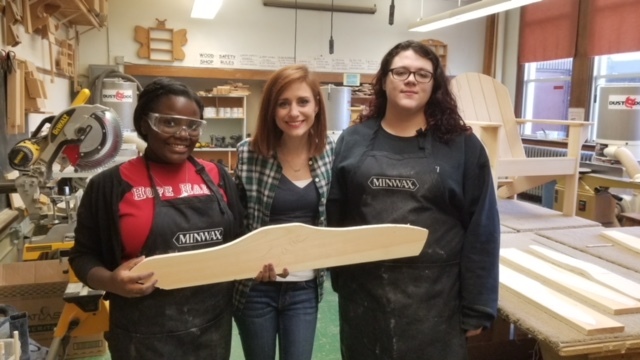 Home /Media Coverage / In Case You Missed It: Check Out Hope Hall’s Woodworking Program in the News! Hope Hall School was featured on local news channels this week to advertise our school’s Woodworking Program and upcoming Annual Woodworking Holiday Sales. Our first Holiday Sale of the season will be held this Saturday, December 2nd at Hope Hall from 9am – 3pm. We will also hold our final Holiday Sale of the year at The Mall at Greece Ridge Center December 15-17th during holiday hours (9am-10pm) in front of Macy’s. 100% of the proceeds raised will support the continuation of our Woodworking Program. Every year we are required to raise at least $15,000 to fund the tools and supplies needed to have credit-bearing Woodworking classes and an after school program. See links below to watch video from our air time on WROC-TV Channel 8, Fox Rochester, and Spectrum Rochester News. Special thanks to news reporters, Mark Gruba of Channel 8, Ashley Doerzbacher of Channel 13/Fox Rochester, and Wendy Mills of Spectrum News for providing media coverage for us! Learn more about our Holiday Sales here! ROC the Day Results are in! Hope Hall School Grossed $1,999 in Donations! December 2017 Hope Hall Newsletter Now Available!